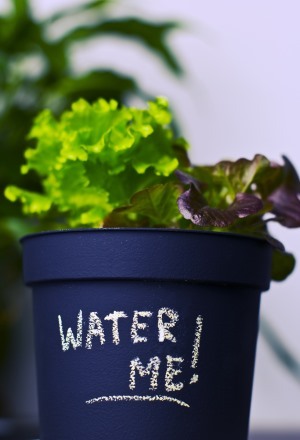 Now you can stop guessing whether your plant needs watered. A plant moisture meter is a sure way to find out. Just stick the prongs into the soil and a gauge will show you at a glance how much moisture is in the soil. You'll know in an instant whether or not your plant needs watering. With this handy, easy-to-use tool, you'll never under- or (more likely) over-water your house plants again. Be extra-kind to your plants. A moisture and light meter does double-duty. It not only it lets you know when your plants are thirsty, it gives you an accurate light level reading, helping you to choose the best location for your plants. Or get a 3-in-1 meter that reads moisture, light and pH levels. Testing soil dryness by sticking your finger in the soil is a common way to check for moisture. However, the finger method isn't the most accurate. You can't tell how much moisture is in the bottom half of the pot, where most of the root mass is contained. Of course, the best thing you can do is pay attention to your house plants. Both overwatering and underwatering can cause a plant to wilt. And, allowing plants to suffer may cause permanent damage. An electronic moisture meter is the most accurate way to gauge how much moisture is deep in the container. Water plants thoroughly, then check the plant moisture meter before watering again. Water thoroughly to avoid leaving dry pockets in the soil. Besides, most of the roots are deep in the pot. Use room-temperature water for your plants. Most houseplants originate from tropical climates and cold water is a shock to them. Use a pot with drainage holes to prevent soggy soil, which leads to root rot. This is the most common reason house plants die. Don't know how much water your plant needs? You'll find watering requirements for your plant in the House Plants Encyclopedia A-Z. High-tech doesn't have to mean geeky. This Singing Goldfinch Meter tells you when your plant is thirsty with a cheery tune. An automatic light sensor lets it know when it's nighttime, so it won't chirp at night. Beautifully hand-painted, this bird is simply charming -- and every bit as efficient at helping to keep your plants healthy. Like Cardinals ? How about a Blue Jay or Robin ? They're available, too. Get a whole flock. Or, just put one bird in your fussiest plant to remind you to check the others.